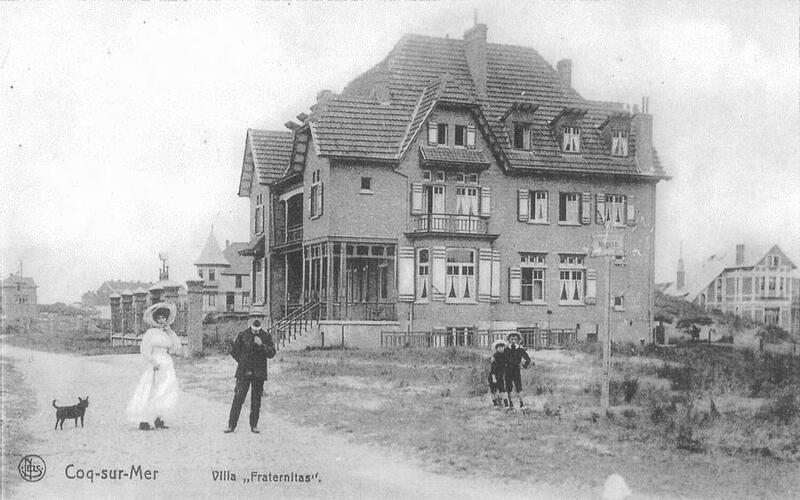 Villa Fraternitas in 1906. There were not yet any other buildings on Murillolaan. Perhaps this is the building-owner and his family that pose (research regarding this is in progress). 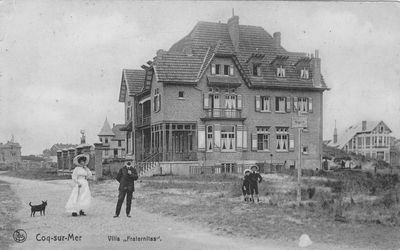 The building of the De Gouden Haan hotel dates from 1906, and formed part of the first lot of private holiday villas in the Concession. The spacious villa was originally built to accommodate a baron. This gave rise to the name ‘Villa Fraternitas’. 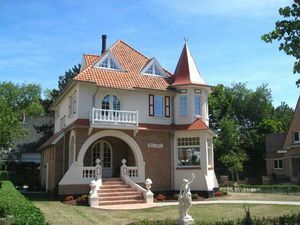 The villa was later donated to the municipality of Jemeppe, and thus gained a new purpose as the children’s home ‘Colonie de vacances de Jemeppe à Liège’. A brick building with cemented and painted facades under varied roofing (consisting of hipped roof, overhanging partially hipped gables and dormers under sloped rooves). Former central loggia and balconies later fitted with glass wall. Bay window with upper balcony on the side façade. Beautiful woodwork, once painted white. The current hotel manageress bought the building in 1982. It then stood empty for several years and was in very poor condition. Gradually, the building was renovated and modernised. In addition, it was always the intention to preserve the original character and the charm of the Belle Epoque era as much as possible. Below you will find a photo gallery with recent photographs of the hotel and its chambers. Click on one of the thumbnails to see larger images. Posters like this were in those days the way to attract tourists. The Grand Hotel is now the De Haan town hall. 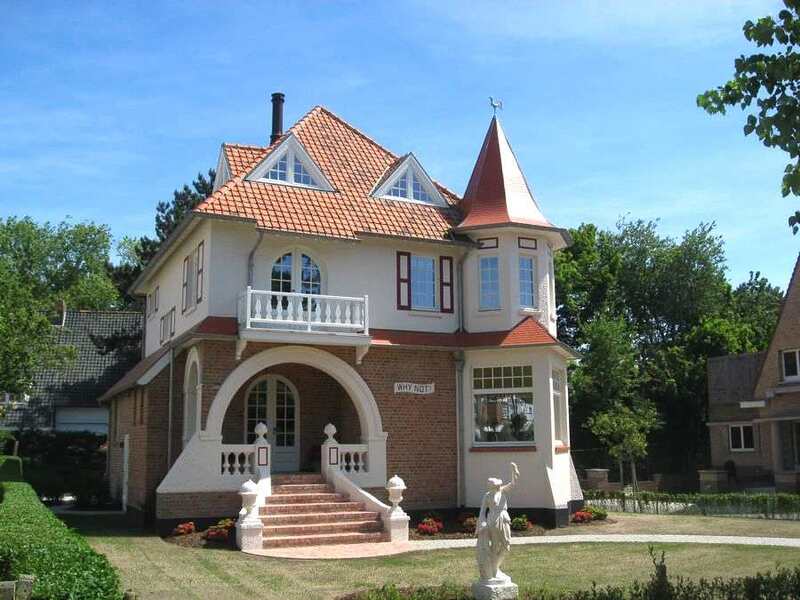 ‘The Concession’ is the elegant, green residential area in the De Haan seaside resort. The area is bordered by the North Sea, by a partially wooded dune strip in the northeast and southwest, and by the tram line to the south. 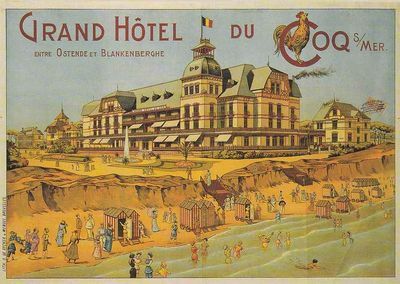 The nascent coastal tourism in the 2nd half of the 19th century, and the commissioning of the steam tram line Ostend-Blankenberge in 1886, were the impetus for developing the poor and remote hamlet ‘Den Haene’. Architect Edouard Colinet from Ostend and Albert Passenbronder from Antwerp were able to convince the Belgian State in 1889 to grant them a ‘concession’ (ground lease). They intended to build a seaside resort in the dunes. We must also keep in mind that tourism and holidays in that period were primarily a thing of the nobility and the wealthy bourgeoisie. It was the German urban design planner Joseph Stübben – a personal advisor to King Leopold II – who in the early 20th century drew up the land development project for a spacious villa park. Typically, a street plan with two central axes (north-south and east-west) surrounded by a network of winding lanes and drivepaths is inviting for pedestrians. The strict building regulations of the 90-year concession needed to ensure that a green and idyllic villa hamlet was established on these grounds. The architecture has a hybrid character. We all too often rediscover the Anglo-Norman architectural style and the ‘country-cottage style’. Art Deco influences are also frequently present, as well as some Modernist constructions. Why Not villa on Rubenslaan. Fully restored in 2014, with stunning results. Even during the Concession period, building regulations were not always respected. The end of the concession contract in 1979 was the perfect time to put the bulldozers and demolition hammers at work for the concrete lobby and its devotees in De Haan as well. Several achitectural monstrosities have since marred the streetscape. The action group ‘Preservation of the Concession’ and some well-meaning residents have tried to save what could be saved. Gradually, this resulted in various conservation measures, and in 1995 the entire Concession was designated a protected landmark. In 2001 the reevaluation was approved. This should allow for the conduction of a dynamic heritage policy, as the owners will thereafter be able to call upon the maintenance premiums for protected monuments. On the website ‘Inventaris Onroerend Erfgoed’ (in Dutch) you will find a brief history of this issue. Despite the many architectural pearls that have disappeared, we can nevertheless conclude that the historical character of the Concession has been largely preserved. The De Haan Concession is still well known far beyond its borders as ‘the Most Beautiful Seaside Village’.